Just a quick entry for the day. Developers/designers etc., be on the lookout for design details/idea coming out from UX torturer. Every design details/decisions matter and most of them likely meant to handle certain user expectations, and if it’s done wrong, it can probably turn a good user experience into an unpleasant one. For today, let’s talk about Simplenote. I love apps with Material Design (who doesn’t?). There is an article at The Verge talking about 10 Material Design apps that your should try, and Simplenote app made into the list. It was a few years back since I last used Simplenote, so I thought why not just try their new app with Material Design – I then went to Play Store look for the app, digested the screenshots and description, and installed the app. Not login? No FAB for you. So this is the first screen I saw once I launched the app – and I thought it is actually not bad since they allow the user to try the app without Sign in and Sign up (It would be better to use Sign Up and Log In to separate the functions though), so I went on to try the app. Look at the screen again. Did you notice what’s went missing from an app that has the new Material Design? Yeah, the Floating Action Button (FAB), which you can clearly see in the Play Store screenshots. So I start thinking “Wait, what’s happening? How do I make the FAB shown? 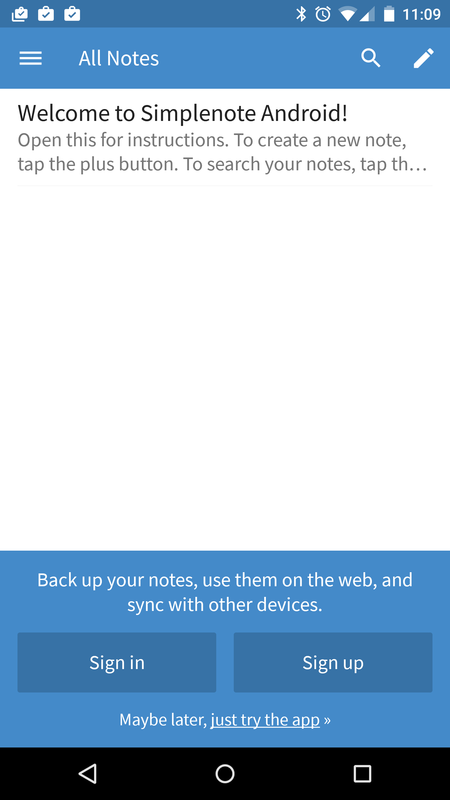 How can I add a new note?”, and I saw the quick guide included with the app. To create a new note, tap the plus button…. Wait, where is the plus button? Should I see a FAB with plus icon, or a plus button somewhere? So I went to Settings and see if there is a setting for it, nope. After that I tap on the pencil button, and it seems to add a new note – and at this stage, I am completely confused. A pencil button that add a note, a guide says tap on plus button to add a note, and where the heck is the FAB? Failed to properly manage user expectation is what’s wrong here. Every design details and decisions made into the app can break the user experience and fail to build the trust. In the case of Simplenote, the onboard is simply confusing and user expectation is not being handled properly. Mishandled User Expectation – The new update of the app mentioned about their new Material Design. In the Play Store screenshots, the users can see the FAB in the main note list, which is a very recognisable UI elements in Material Design, so the user most likely will expect to see that when the app is launched. But as you can see, it is not shown during the first launch, and it is placed at the toolbar for non-login users, which is both confusing and less discoverable. Confusing Instruction – They included a note to guide the user about the app, which is not a bad idea, but the content is confusing. Instructing the user to look for a non-existent UI element is just bad – very bad. Forgotten UI Consistency – This is a bad, or rather confusing decision. I guess the decision is made because the designer doesn’t want to show the FAB above the Sign In/Sign up panel, but I don’t think placing it at the toolbar just for non-login user is a much better idea. Screenshots are the most important preview of the app, and the user expect to see everything they saw in the screenshots, or at least if it’s meant to be a premium feature, it must be mentioned clearly somewhere in the app. Unless it’s an informed and necessary decision, UI consistency is more important than anything else, regardless it’s for free/unregistered or paid/registered users, everyone deserved the best experience. Don’t be an UX torturer. Perhaps the things that I mentioned above are just really minor details (or some people might say: who cares? ), but as a designer, these are the things that you really want to look into more carefully because they are there to handle the user expectation, and a bad choice can potentially cause bad user experience. Thank you very much for writing up this feedback, we’ll look at it and hopefully have it fixed in an update soon. Really good example. Thank you. And thank you for the wise quote at the end. That can be a really good UX poster. Wonderful post. 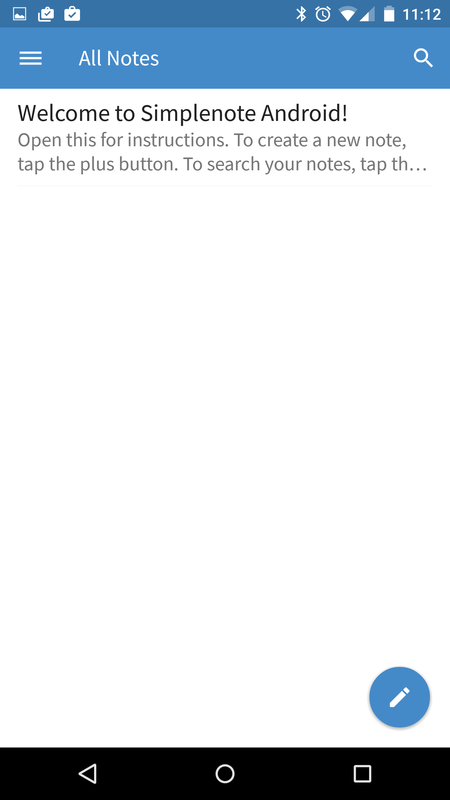 Could you please make such a post taking some banking apps from PlayStore. I don’t see any banking app which follows android guidelines. to see the FAB on startup, what if you tap the “just try the app” below the two shining big buttons? My point is that it confused the user that the FAB is not showing up if you are not login, and only show up when you are logged in. If you are not logged in, the add note button is at toolbar instead of FAB, which is just strange to do something like this because the experience is not consistent, considering the add note function is the core interaction that the user can have in the app. Love the case study and your eye for detail. Brilliant. I like the way how you look for opportunities to improve the design.